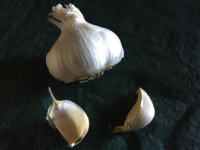 There are two main types of garlic: softneck, which produces numerous smaller cloves, and hardneck, which has fewer, larger cloves surrounding a stalk or 'scape'. Elephant garlic is not a true garlic (more closely related to leeks), but its cultivation is similar to the true garlics. It has very large, mild-flavored cloves. Select a sunny spot with soil that is well-drained and amended with organic matter. Break the garlic head into individual cloves, taking care to retain the root callus and papery covering on each clove. Use the largest cloves for planting because larger cloves will yield larger bulbs. Plant cloves 4–6" apart and 1–2" deep, with the root side down and the pointy tip up. Fertilize once after planting and again when the weather warms up in the spring. If a scape appears (a central stalk), remove it to preserve the bulb size. Scapes are edible when young and tender. Stop watering in May when the garlic tops begin to turn yellow. A useful mnemonic for remembering the tasks: Plant by Thanksgiving (November), fertilize around St. Patrick's Day (March), stop watering by Mother's Day (May), and harvest around Father's Day (June). Allow the bulbs to remain in the ground for several weeks after the tops turn to brown, then dig up around in mid-June. Be careful not to nick the bulbs when digging. Cure the bulbs for about two weeks after harvest by placing them in a warm place out of the direct sun with good circulation. Tops may be braided to make a rope of garlic for hanging or trimmed off as desired. Trim the roots. California Early White A subtle, mild tasting garlic variety developed for the California garlic industry, known as Gilroy garlic. California Late White One of the two Gilroy cultivars. Inchelium Red A soft neck garlic that is mild at harvest but increases in flavor during storage, and with just a touch of spicy heat. Music Full flavored, rich aromatic flavor. It is a go-to for many first time growers. Spanish Benitee Mild pungency with long storability. Susanville Considered an improved selection of California Early.